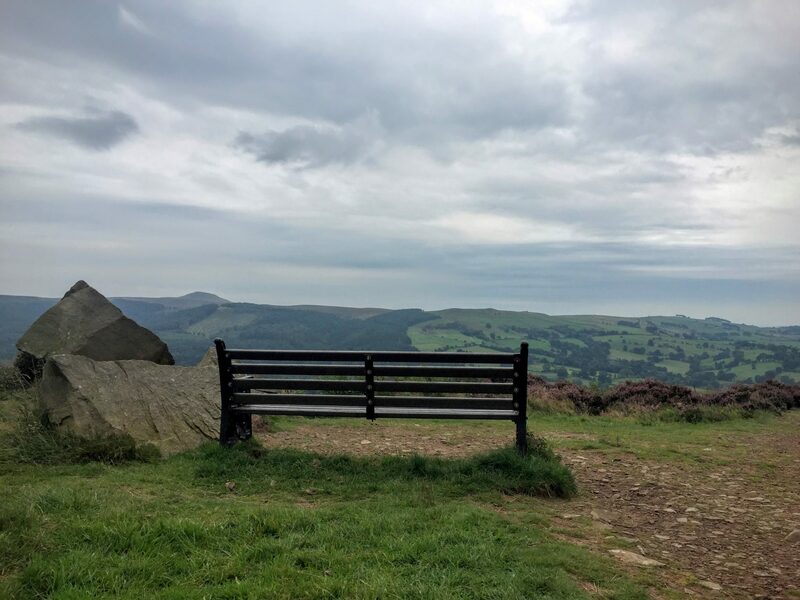 You can get some good exercise in too, by doing the hills up and down – there are benches on the route so you can stop for a break. 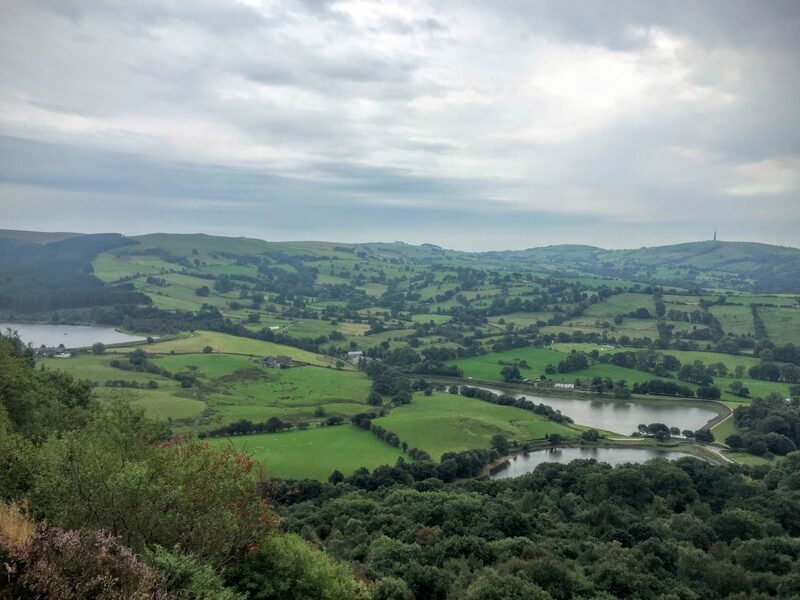 We decided to travel out to Teggs Nose as it has been what feels like ages since we were last there and we fancied a bit of a hill walk. Plus, it isn’t too far from our house so an easy one for an afternoon out. We set off in glorious sunshine, sun roof and car windows open to keep the breeze flowing. About half way into our journey, some drops of rain appeared on the windscreen, then some more. Shortly later my wipers were on double time and we were watching the clouds turn grey right before our eyes. Normally the belt and braces kind of packers when we’re heading out for a hike in the car we would have everything we needed but this time we were overly optimistic about the weather. We didn’t bring our waterproofs. There we were in t-shirts and shorts, suntan lotion’d up and ready for some heat when it looked more like an autumnal morning. Luckily we had the legs for our trousers, our fleecies and our baseball caps so we could at least pull together some sort of suitable outfit. 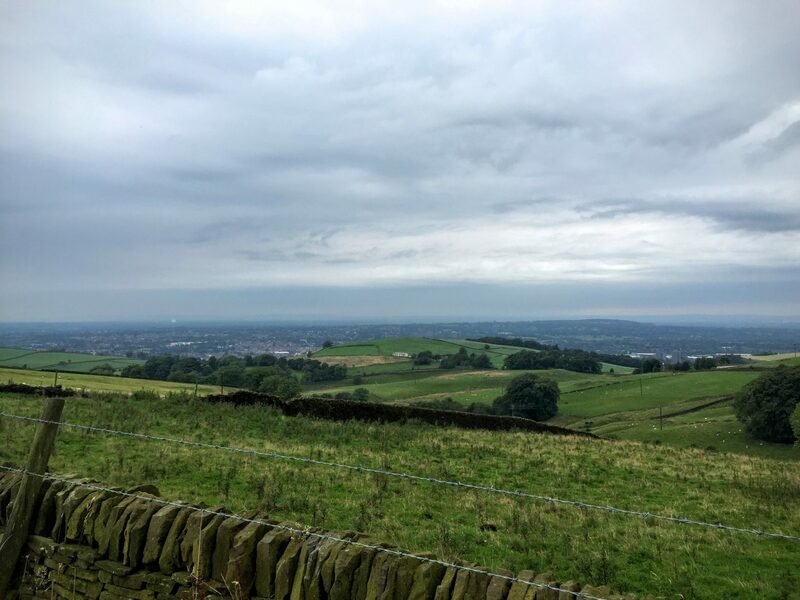 We lunched in the car while urging the clouds to move away, commenting that ‘it’s clearing up over there’ every so often to keep the summery feel going. 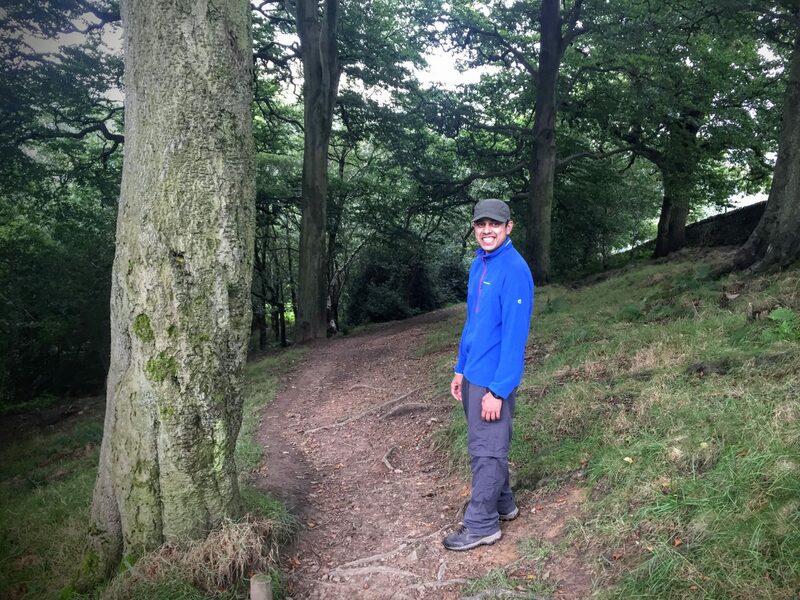 It did begin to ease, so our makeshift outfits were fine for what we were about to do – we weren’t taking the hiking route, so minimal kit was fine. 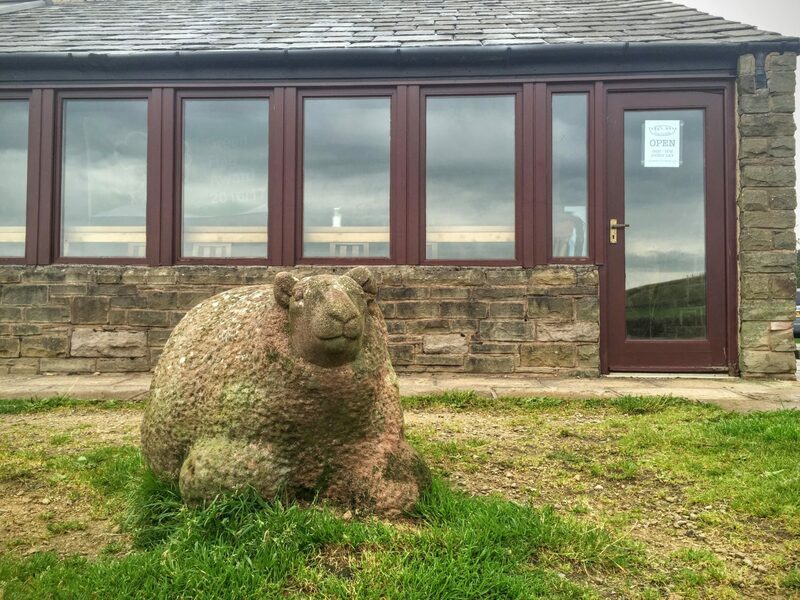 We nipped over to pay for our parking at the visitor centre and pop to the loo too (ladies, can I advise that you wait for the lady’s toilet rather than using the unisex, unless you like your head right next to a urinal!!) and to grab a map from the centre. It was drying off and the wind was holding so we were sorted in our kit. Once we decided that we could cope with what we had one, we set out to get our walking going. The clouds were moving across and slowly clearing up so we were in for a treat with the views. 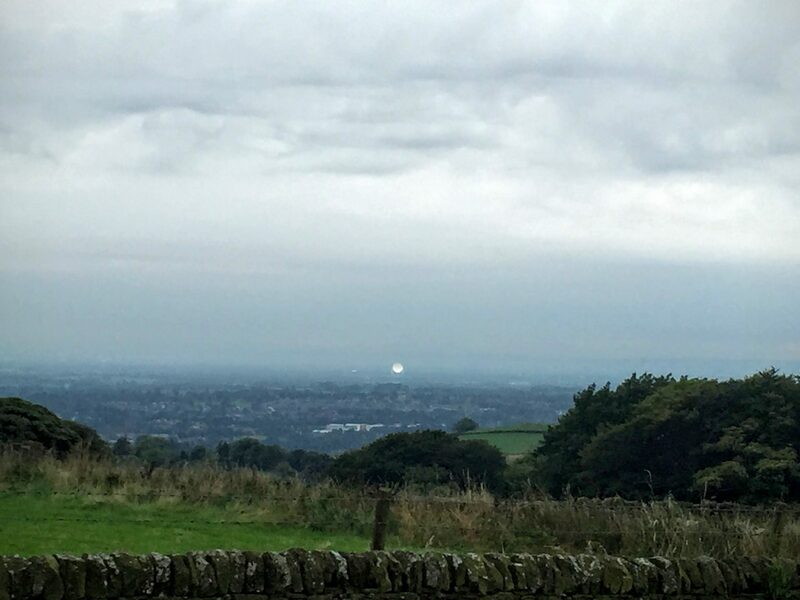 From Teggs Nose summit you can see all around Cheshire, including Jodrell Bank in the distance. It is lovely seeing the white of the telescope popping out through the green fields and trees of the Cheshire countryside. 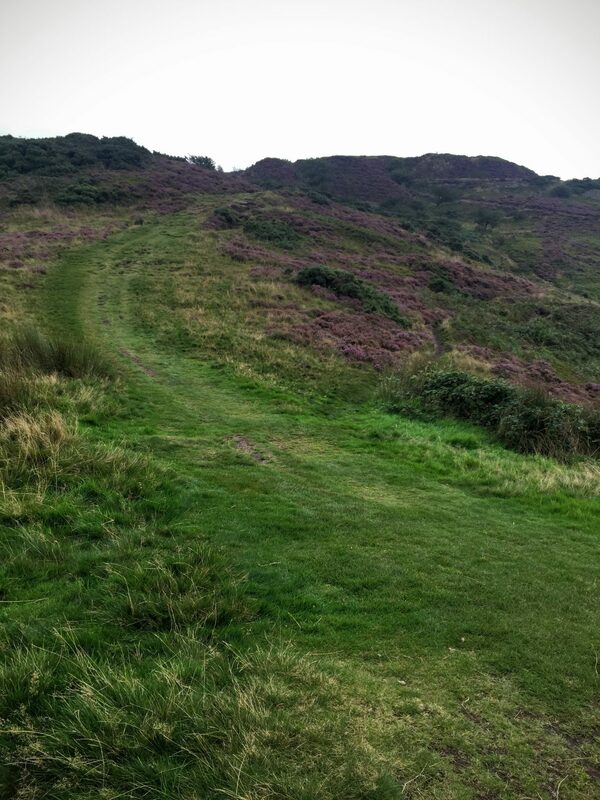 The walk eases you in nicely up a slight hill through glorious purple Heather. I was honestly surprised to see it flourishing so much as we usually get to enjoy it a bit later around there. We were please to see that it had come out especially for us though. 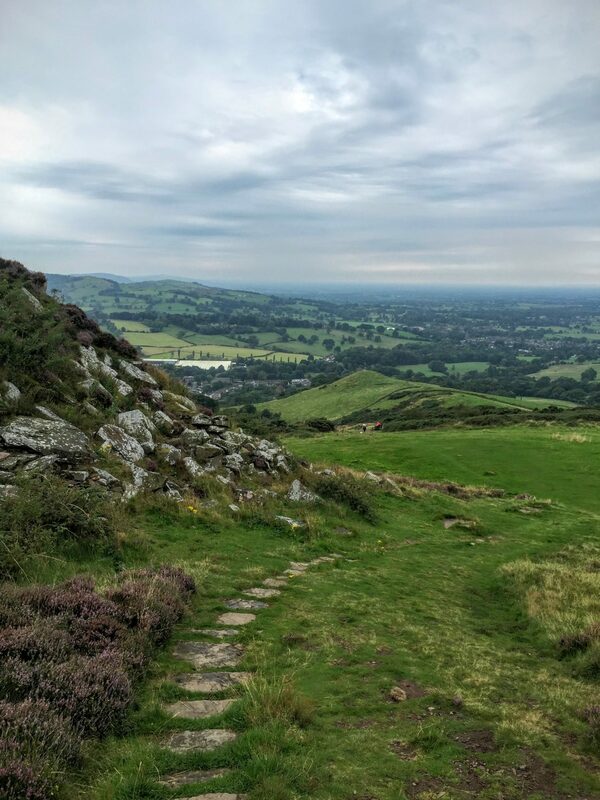 While walking up the hill, take a moment or two to take in the views around Cheshire – even through the clouds, you still have the joy of the green and lush fields, the glimpses of city life and the wildlife living around there. 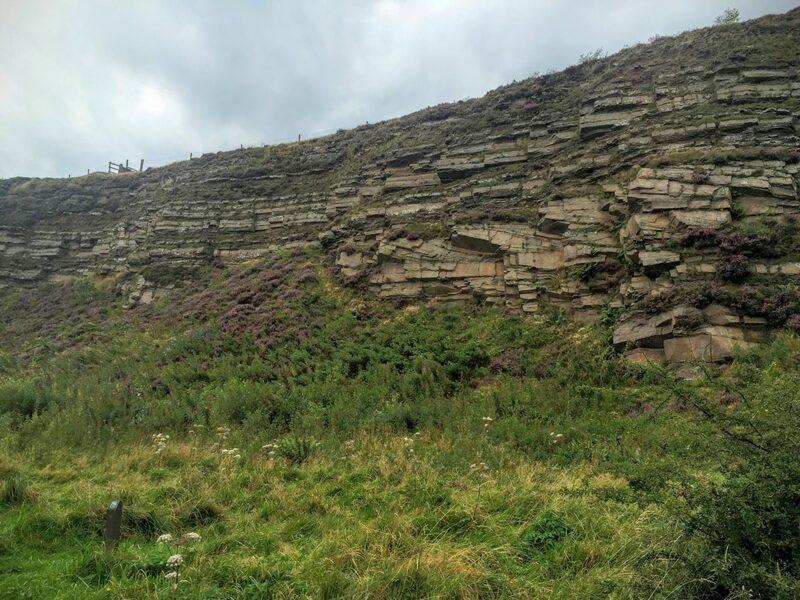 Following the hard standing path around it will bring you to the quarry wall where you can see the layers of stone still holding in the side of the hill. The heather blends the harsh scar lines of the rocks with the grassy edge beautifully. 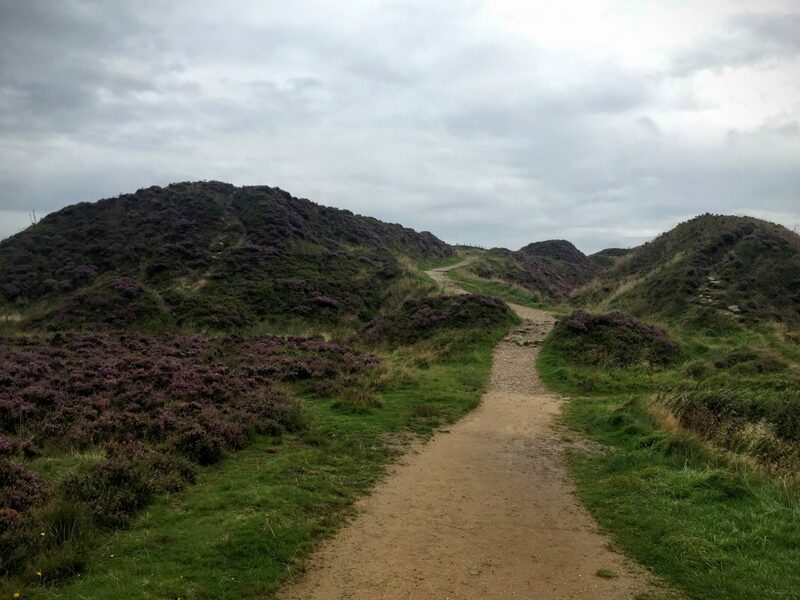 This area was used for quarrying from the 1500s to 1955, so you can imagine the amount of people who have walked this land – it is amazing! 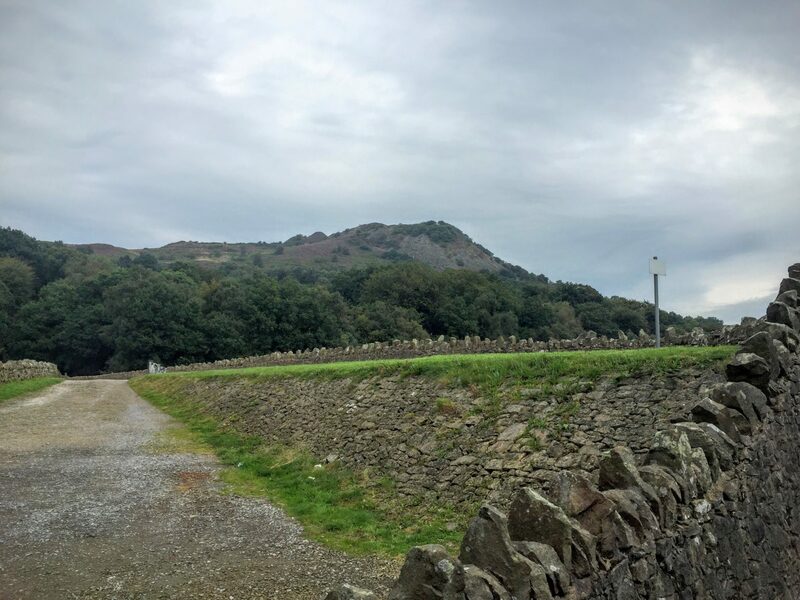 This is the perfect opportunity to look over the Cheshire landscape, feel the breeze in your hair (wind in our case) and rest before heading onto the hill walks. …and this is what you will see from your seat! 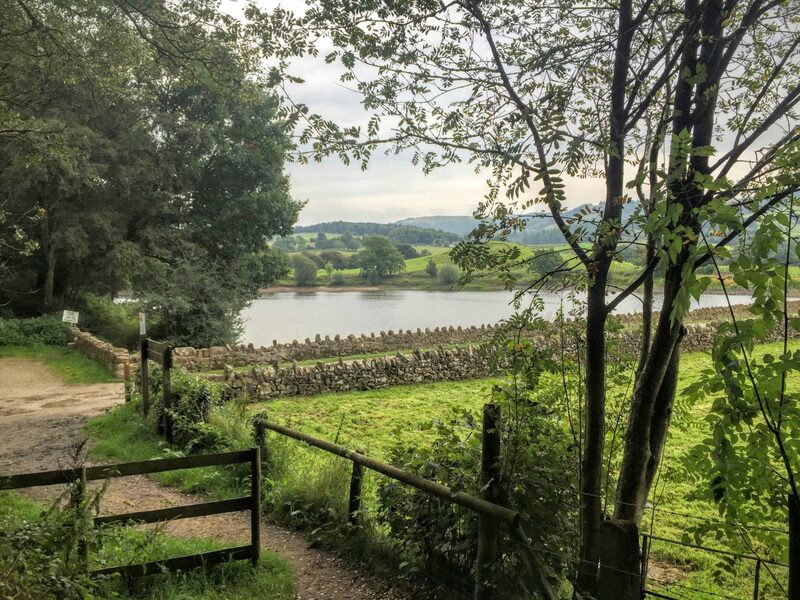 Our walk took us around the whole easy route before we decided to head down the hill, through the woods and down to the reservoirs. Remember to keep your eye peeled for interesting things, cute little happenings and of course creatures that live and play there. 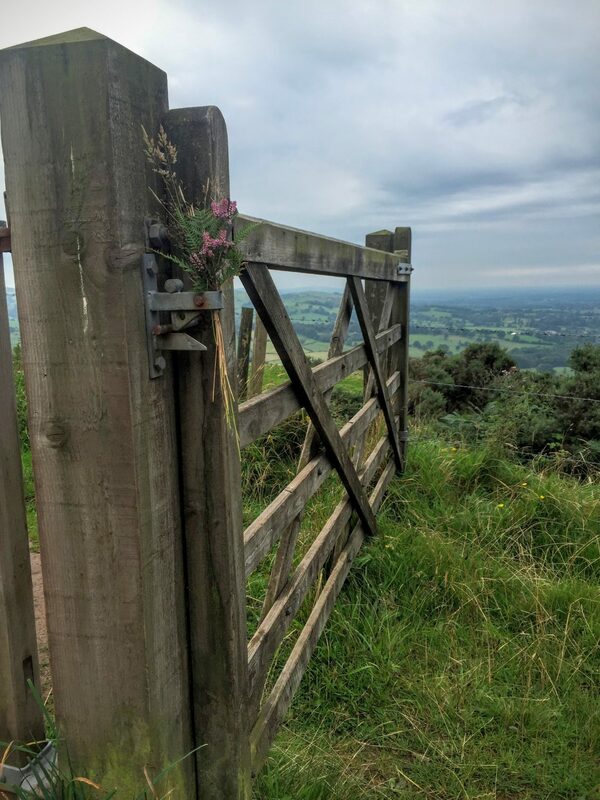 I spotted that someone had beautifully displayed some flowers and seed heads in the gate, which was perfect for a shot of the traditional gate with the view. You never know what you might find when you look around you and explore! The hill is pretty steep, but does have some steps and foot grooves to keep your footing. There are benches to rest and enjoy the view and lots of beauty on the horizon to keep you mind fully entertained for the entire walk down. Although the path down the hill is winding and looks a long way, it doesn’t take long for you to reach the woods – a perfect spot for some shade if it’s getting sunny and warm. Honestly, we were starting to warm up once we were power hiking our way around the paths and down the hill. From here it is only a short walk until you head down towards the reservoirs. There are often some HUGE puddles to get over the bridge to view the summit and reservoirs in all their glory. But slopping across or skipping around on any dry patch you find is pretty fun anyway. 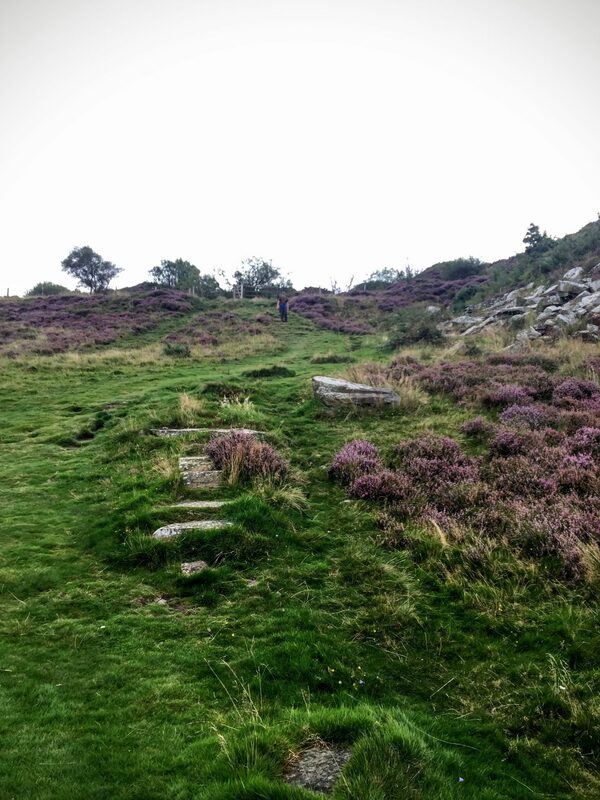 There are two ways back to the top one which is more path (the one we took) and one with more steps. We decided to head back the way we came this time because of the time and the very loud sing-song-y people who seemed to be heading down the other route. Setting back up the steps, it started to get much warmer – especially the faster and harder we pushed ourselves to get up the incline. 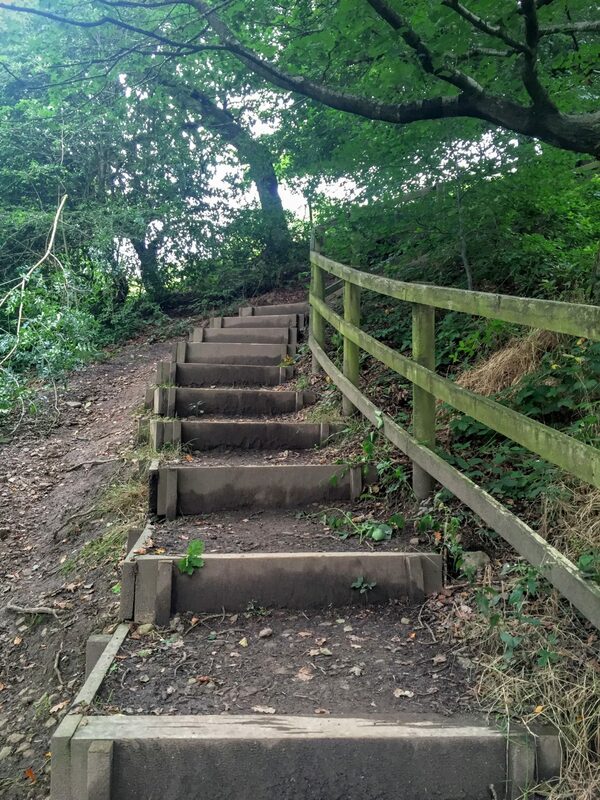 The steps give you a good start to the hill and they lead onto the grassy slope that takes you back to the path at the top. Remember to look back when you’re taking a breather, the views are spectacular and make the effort worth while. The slope looks far worse than it is – yes it’s a challenge, especially in the wind, but there is good footing. If you look to the top of the second picture, you can just about make out Jit near the gate – I thought I’d take it to show the incline. Once back to the track, take a left and head around to reach another path that will take you to the right and up to the summit. 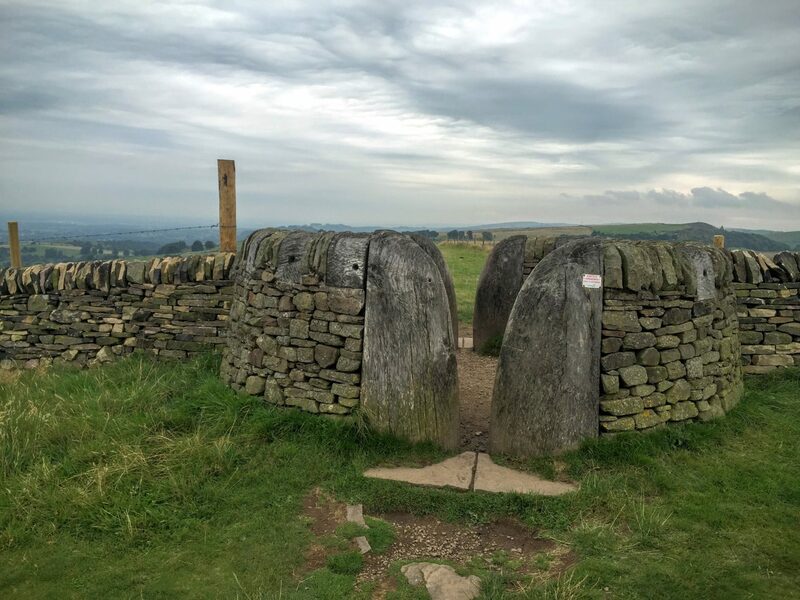 This is where you’ll get the best views, battered by the increasing wind and also learn where things are in the stone circle. The warmth had well and truly taken by this point of our journey, but the wind was picking up nicely as we wandered around the summit taking in the views. I tried to do a video, but it is so windy that I was almost losing my hat and you can hardly hear me at the beginning! 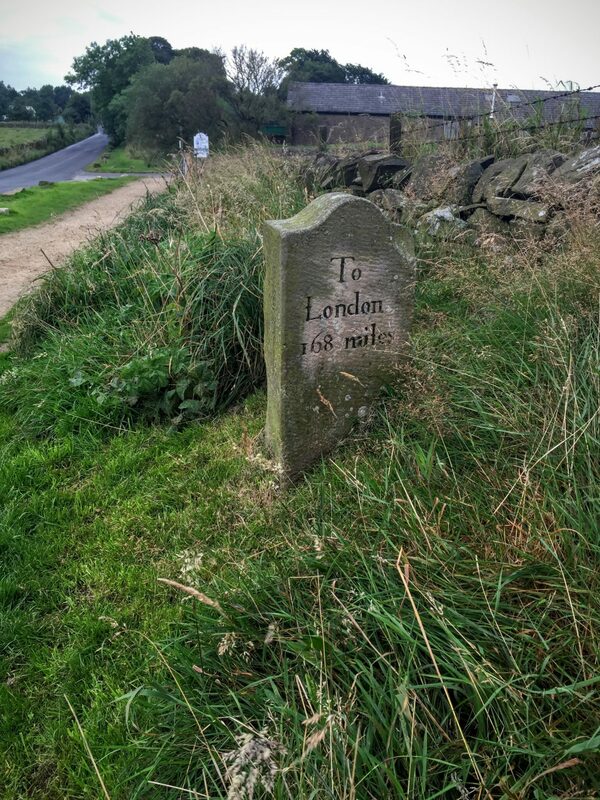 With the wind picking up and time getting close to home time, we headed back to the car park, passing by the sheep and a sign to London. Who knew it was only 168 miles? Sounds pretty easy when I see that I do around 80 miles a week in just morning and evening walks. Probably not when it comes to reality, mind you. We nipped for a wee and to grab some more leaflets before heading to the car and stumbled upon a small photography exhibition in the Ranger’s office. There were some truly stunning shots, especially the ones of the night sky and the stars (I didn’t get a picture, you’ll have to go and visit!) If you are visiting, do try to pop in, you’ll see some great bird shots, nature observation and the fantastic night sky pictures too. 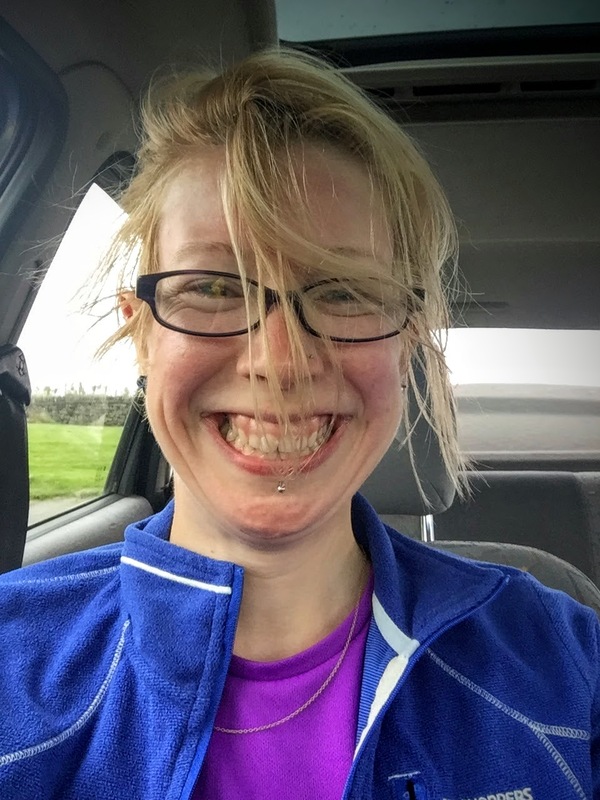 With just enough time for a drink of tea and a snack before driving back we got to see our (or should that be more my) post wind hair style – I kind of like it! Shows we’ve been out in the fresh air! 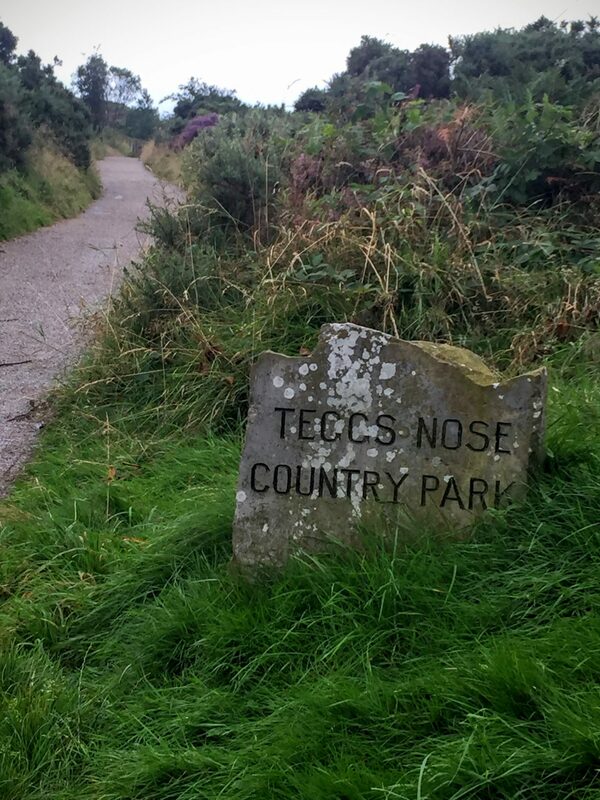 Despite the rain and wind, it was a fantastic day for a visit to Teggs Nose Country park in Macclesfield. Yeah, it was blustery, yeah it was a bit wet, but the heat soon dried us off and kept us warm while we hiked up and down the hills and around the reservoirs. At least the view was clear and we could see the lush green fields around us from among the purple heather. What have you forgotten to bring on one of your trips? How did you get over the challenge of not having that thing?